I took my 17 year old son to enlist tonight. That's him with my daughter and I at his high school graduation a couple weeks ago. It surprises me that hours later, I am still crying. I thought I'd just say goodbye and turn my attention to the next thing. I know he is prepared. We were all prepared. I knew this day was coming for months in advance. Years, really. I willingly signed the papers that allowed him to join before age 18. So it should have been no big deal, right? Ha. Right. I never knew I had so many tears in me. I can't quite explain what is going on behind the waterworks - it feels like some kind of primal maternal grief. It makes no sense, but that doesn't seem to matter. My boy is now a man. My role has changed forever. And I will miss him. That goofy earnest grin, thumping down the stairs on that impossibly noisy body. The pocket knives being snapped open and closed ad infinitum. The overly technical explanations of all-things-computer that I could hardly understand a word of. The military will be so lucky to have him. Ever since he was a little guy, he was always willing to drop anything to help someone. 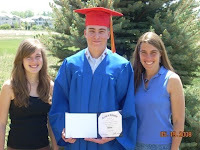 We moved a few weeks ago, during the time that he was preparing his final presentation for his high school graduation. Nevertheless, he provided solo tech support and heavy lifting for me and his sister. He had so many tasks of his own to complete, but the second he got wind of the teensiest curse emanating from the vicinity of my desk, he was at my side, ready to assist. It seems like yesterday that I first looked into his newborn eyes and was shocked to realize that there was someone already in there, not just an empty vessel waiting to be filled. I can't believe 17 years could possibly have passed since then. They have been wonderful years, truly. I love my son with all my heart, and I could not be prouder of the man he has made of himself. I know I have said this before, but perhaps it bears repeating. The active parenting years fly by. Few of us, parent and child alike, will remember the details. But your children will remember some things after they are grown: things like whether you approved of them, trusted in them, or gave them the benefit of the doubt. They will remember whether you had confidence in them or not, and whether you saw their good intentions. They will remember if it was safe to tell you everything. They will remember the tone of your voice. In fact, it's entirely possible that not only will our children remember the tone of our voices, but they may even hear our words to them repeated in their own minds for many years after they have left our care. So today, while your kids are young and making so many mistakes as they figure out how things work, please be aware of how you speak to them. You still have time to make sure that when they leave your nest, you will feel good about the inner parent they have created from your example. And while you may still cry as they walk confidently away, your tears will be those of pure and simple sadness, untainted by regret. And how interesting that as I write these words, my tears have finally stopped. For truly, I have no regrets. For this I can thank the many excellent authors and mentors who graced my parenting journey with the wisdom of their experience, as well as my own mother, who so gracefully continues to be the source of a parenting template based on unconditional love and respect. Oh, and I can also thank my very shoddy and selective memory, since it has not stored up anything I am ashamed of for me to remember. Except that one time, when he was a toddler and in a very defiant phase, when I snapped and swatted his bottom. I felt terrible - that look in his eyes was devastating. Until that moment, he had trusted me implicitly. For the first time that day, I saw him fear me. Ouchie. If you find some memories that you regret, too, it's never too late to make amends. Tell your child of any age what happened, how you feel about what you did, and what you wish you had done instead. Ask about their memories, their feelings, and their experiences related to that. Ask for their forgiveness, and forgive yourself. Then move on. We are all doing the best we can in any given moment. postscript: what a difference 24 hours makes! there's something magical for me about expressing my feelings in writing. once I have fine tuned the words so that they feel like the exact expression of my feelings, the feelings themselves seem to dissipate. maybe the ink holds them instead of my heart -- I dunno. What I do know is that I felt immeasurably better when I went to bed last night, and the trend has continued. So in a way, the words above are already lies, because my experience has changed. But I'll leave them here anyway, in case they resonate with someone else someday.